Nardelli is the lead singer, songwriter and overall "main man" of The Syn. In the past, The Syn has included Yes members Chris Squire, Pete Banks and Alan White in its ranks, and currently boasts a lineup that is every bit as impressive. 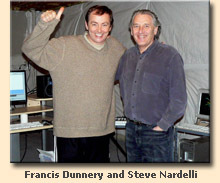 Nardelli is joined by Francis Dunnery on guitar and vocals and Tom Brislin on keys and vocals. Dunnery is probably best known for his work in the legendary band It Bites and for his great solo work. He also played in Robert Plant's band (the Led Zeppelin connection continues with Umbrello Records featuring John Paul Jones on their up- coming Julie Felix release). Tom Brislin was the very talented keyboardist for Yes on their symphonic tour and not only has worked with Meatloaf and Debbie Harry but also has his own band called Spiraling, which has developed quite a following. The Syn will also be joined on the new album by a number of very notable guest performers. The CD release will mark the launch of Nardelli's US operation. His new company—based in New York—is Umbrello Music Entertainment. UME's main focus will be delivering quality Music via such Web 2.0 portals as IPTV, mobile telephone and multi-digital download. "Technology is transforming the industry." says Nardelli. "You can either be a part of it or sit back and watch. Either way, it's going to change the way music is presented from here on out." In step with his innovative style, Nardelli will lend his vocal and songwriting talents to "14 Hour Technicolour Dream: The Virtual Band." This side-project will feature the talents of many individual musicians working together—virtually—from locations throughout the USA. Participants signed onto the project thus far include Umbrello Records recording artists Kurt Michaels and Anton Roolaart, the California-based indie band The Tomorrowes, and both indie recording artist/producer Kevin Still and vocalist/project executive producer Steve Sikes-Nova. 14HRTD:TVB is currently underway with plans to have its first Nardelli-penned song ready for release around the same time that Big Sky will be released worldwide. "With so many projects brewing, this is sure to be an exciting year for us and our fans," said Nardelli. You can keep posted on The Syn at their website (www.synmusic.net), their myspace (www.myspace.com/thesyn) and their myspace blog (blog.myspace.com/thesyn). 14 Hour Technicolour Dream is a Yahoo group devoted to The Syn and it lives at http://groups.yahoo.com/group/14Hour. Umbrello Records home on the web is www.umbrellorecords.com and their myspace is www.myspace.com/umbrello_records.